It is really very difficult to work with colors. For professionals it is really a difficult task to get the accurate colors from the screen to the print. So if you are also working on colors and are looking for a software which will help you with centralized Control Panel interface for managing ICC color profiles and ICM 2.0 color settings then you can install Microsoft Color Control Panel Applet for Windows XP. With the help of Microsoft Color Control Panel Applet for Windows XP you can easily manage Windows color settings. Install and uninstall ICC color profiles very easily. You can Inspect, Rename and Compare two different color profiles. 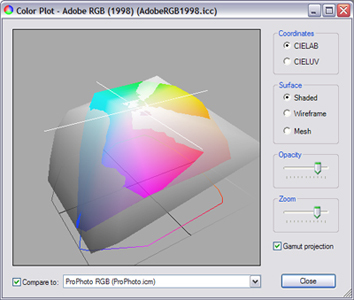 View a 3D graphics plot of color profile color gamuts. Apply custom color gamut adjustments to one or more display devices. You can Display calibration reminders at specific intervals. A photographer can use this tool to switch between two different display color profiles (one for his Laptop, and the other for the external projector) when delivering a presentation using a Windows XP notebook computer. You must be logged in as an administrator to use this software to install or uninstall color profiles and to even to associate color profiles with devices.